The tiny union territory of Pondicherry was once the largest French colony in India. And even today that French influence is still visible, you will feel it especially when you take a walk around the villas in French quarter. 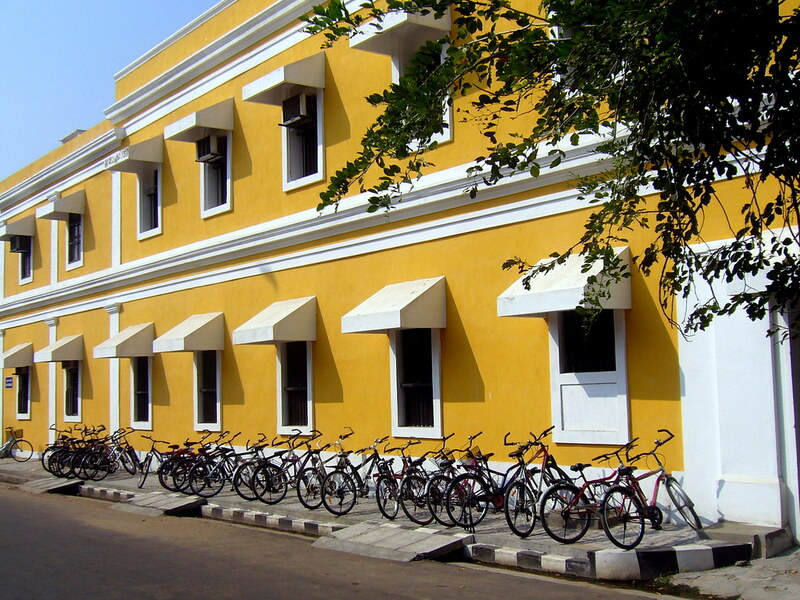 There is no shortage of places to visit in Pondicherry, there is something for everyone! 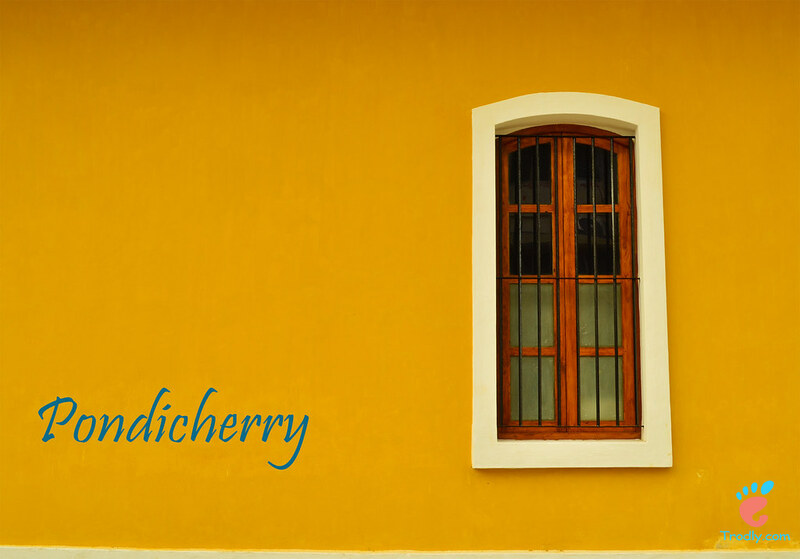 Once home to French population, these beautiful houses now make up as one of the top attractions in pondicherry. One of the top top 10 tourist places in Pondicherry is the famous Pillayar temple. Located right in the center of Pondicherry, old Pillayar temple dedicated to a Lord Pillayar, a form of Ganesha. The temple is visited by local and tourists alike. And while you are there in the Pillayar temple don’t forget to get the blessings from Lakshmi, the temple elephant. Interestingly the temple Elephant at Vittala temple in Hampi is also named, Lakshmi. If you are just in time you can partake in the evening aarti and immerse yourself in the charged atmosphere. 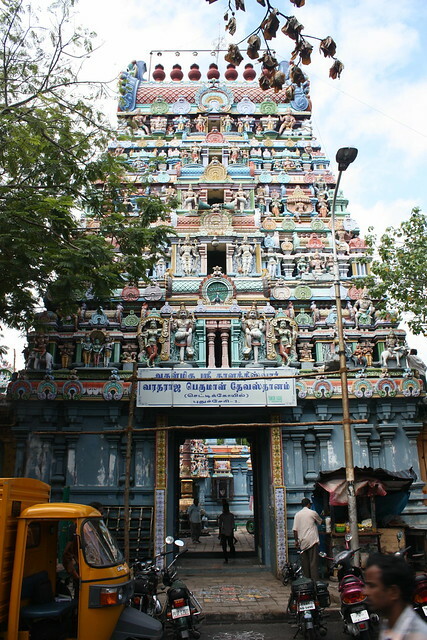 It is one of those rare temples in south India where foreigners are allowed inside. The French quarter and the beach are close by so you can combine all three in one walk. Not to be missed is the marvelous golden chariot. Attending the evening Arti gives the feel you are in one of the best places to visit in pondicherry, India. 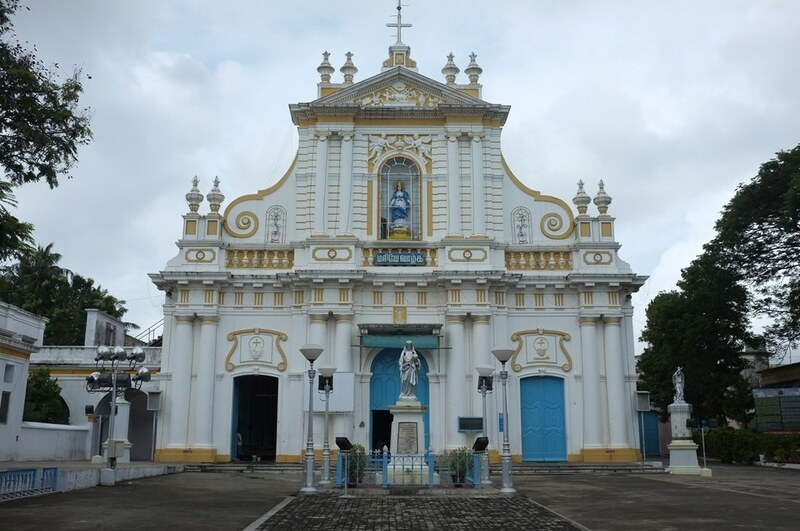 Among best tourist places in pondicherry is the majestic French colonial church. Sacred Heart of Jesus is an old heritage church situated on MG Road, bang opposite to Pondicherry railway station. The church was constructed in 1907 and its gothic architecture style is a marvel to look at. If you love history, I will recommend you to add Sacred heart of Jesus in your bucket list of historical places in pondicherry to visit. Also known as ‘Eglise de Notre Dame des Anges’, it is a roman catholic church looking out over the Bay of Bengal. The church is located in white town close to the rocky beach and the Gandhi statue. My travel advice? Don’t miss Our Lady of Angeles while your holiday in Pondicerry! The church was constructed in the year 1855 in the Greco Roman architectural style. French service is conducted daily beside Tamil and English; fine limestone work on the façade of the church will catch your eye. Another gem to be visited of the historical places in Pondicherry. Due to it’s colonial past Pondicherry has several historical places, the amazing Immaculate Conception Cathedral is one of the jewel in that crown. Undoubtedly the church one of the most beautiful Pondicherry church I have seen. Several hundred visitors throng to the church everyday during the peak tourist season in Pondicherry. Even, if you are short on time make sure to time for the visit to the church as it is one of the most important places in Pondicherry. What do I like the most about Immaculate Conception Cathedral? Obviously, it is the gorgeous facade! Just look at the detailed carving work done! Sure, you must have seen the famous golden ball umpteenth time on social media! If you are looking for interesting places in pondicherry, make sure you pay a visit to Auroville. Founded by the great spiritual teacher Sri Aurbindo, Auroville is a fledgling self-supporting community. For those who are still wondering what this place is all about, in essence Auroville is a spiritual retreat and a Yoga center. Auroville is located around fifteen kilometers from center of Pondicherry, at a time houses more than 2000 people. No wonder many tourists consider Auroville a must see in pondicherry! The trip to Auroville can easily fill up your entire day, so add this to the top of your list of places to visit in pondicherry. 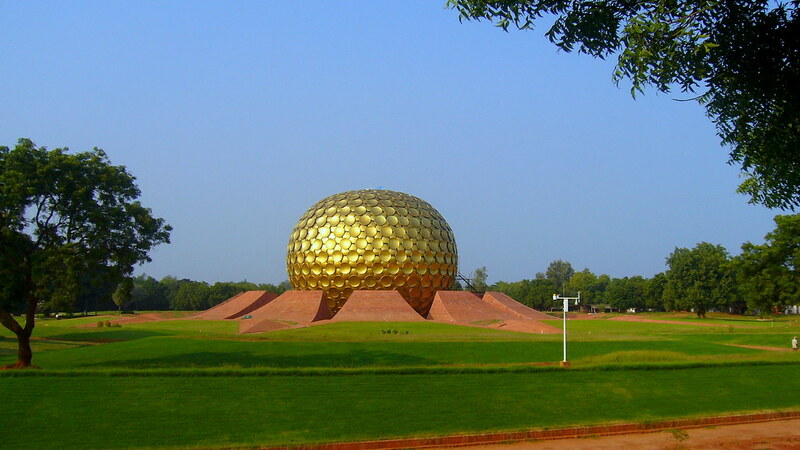 Alternatively, you have to give it exclusive time and consider Auroville as places to visit in pondicherry in 2 days. Sri Aurbindo left freedom movement when he found his call in spirituality, in 1926 he founded the Aurobindo ashram. The township itself was established much later in 1968. Later after his death, the community grew under the guidance of The Mother, Mirra Alfassa, a woman originally from Paris who spent her days preaching the philosophy of Sri Aurbindo. You can read more about the Mother here. You may roam around freely in the area but certain areas are inaccessible and you need to have proper pass. Bureau Central, the information center, issues pass. You can stay overnight in a guest house in the Ashram but you need to book in advance as accommodation generally get sold out. If you are further interested in exploring the philosophy and teachings of Sri Aurbindo, a complete list of work by Sri Aurbindo is available to download in pdf form from the official website here. 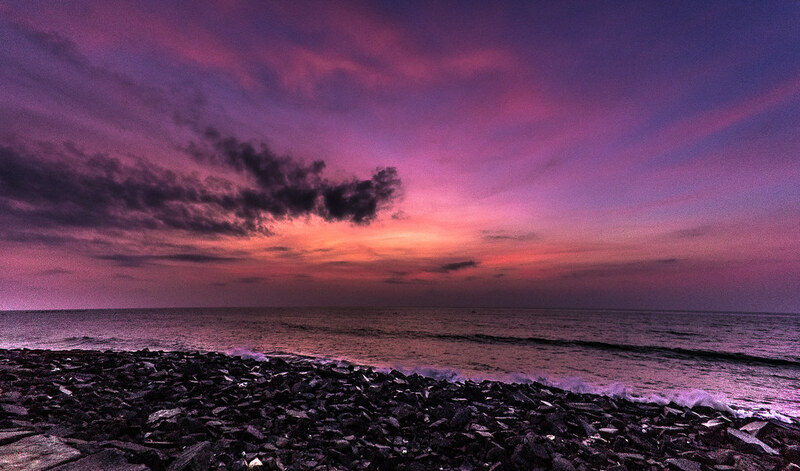 One of the best beaches to truly enjoy the tranquil colors of sunset in Pondicherry. The beach is bit further from the center but it fits nicely into your itinerary of places to see around pondicherry! Lazy walk around the mission street. Watch the sunrise on the beach. Eat delicous french pastries in several of the french style cafes. Stay in a hostel and make friends with tourists around the world. Located right in the middle of white town, the best location to stay in Pondicherry. Deluxe double room will cost you 2500/- INR. Breakfast is included in the price. One of the Best budget hotel to stay in Pondicherry White Town. 1 Bed room apartment will cost you around 1900/- INR in peak season. Pick this if you are looking for a heritage option within budget located in Pondicherry White Town. Small double room will cost 1450/- INR. Though not in White town, but just there on the other side of the road. A brand new hotel in Pondicherry, where standard double room costs 1200/- INR in peak season. Distance between Bangalore and Pondicherry is only 320 kilometers which can be easily covered 5-6 hours. It is best that you visit Pondicherry from Bangalore by car, otherwise you can take the Bangalore to Pondicherry overnight train. The Yesvantpur-Puducherry Weekly Express starts at 9 PM from Bangalore and reaches Pondicherry early at 07:15 AM. Here’s a detailed guide on getting to pondicherry from Bangalore. 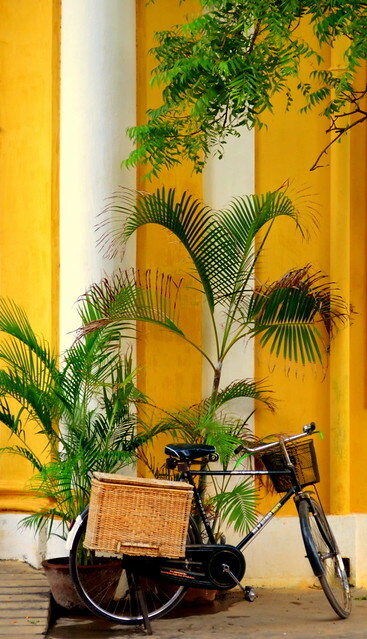 One day in Pondicherry makes sense if you are in for a quick day trip from nearby Chennai. In other cases, you should consider at least spending 2 days. Pondicherry also fits in as a good 2 days travel getaway for people in Bangalore and Hyderabad.